It will be an absolute treat to stay at Pier Watch Villas I in North Myrtle Beach, South Carolina. Pier Watch Villas I will accommodate more than a dozen family members or friends when you stay in North Myrtle Beach. Whether you are here for a family vacation, family reunion, wedding, golfing trip or just a marvelous North Myrtle Beach vacation you will be pleased to stay at Pier Watch Villas I.
Pier Watch Villas I is a North Myrtle Beach resort that is located in one of the best spots in North Myrtle Beach, South Carolina. Pier Watch Villas I is located at 3400 North Ocean Boulevard in North Myrtle Beach, South Carolina. It is in the Cherry Groove section of North Myrtle Beach. Pier Watch Villas I sits beautifully on the Atlantic Ocean touching the warm sandy beach. Pier Watch Villas I is a North Myrtle Beach resort that is next to an amazing fishing pier and only a few blocks from Highway 17, the road that will lead you to all of the phenomenal North Myrtle Beach activities. This North Myrtle Beach resort offers you a place to park your car in a large covered lot just under your North Myrtle Beach condominium. There are both stairs and an elevator to take you up to your North Myrtle Beach condo rental at Pier Watch Villas I. Ease and relation is key to staying at the Pier Watch Villas I North Myrtle Beach resort. On the back side of this North Myrtle Beach resort you will find a large inviting sun deck. 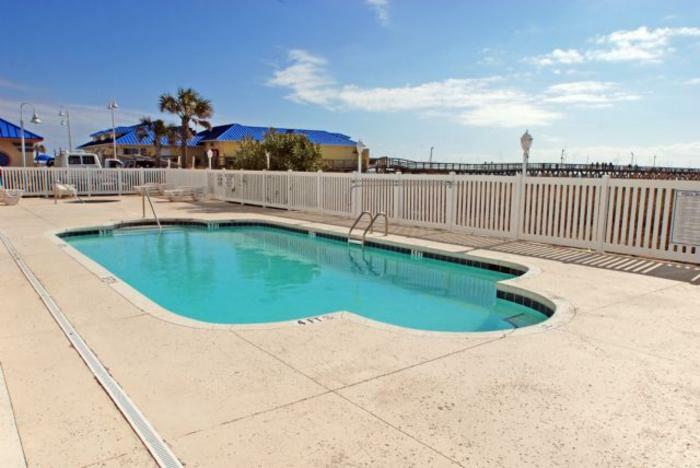 Pull up a relaxing lounge chair around the swimming pool at Pier Watch Villas I and work on your North Myrtle Beach vacation tan and just relax. Take a dip or splash and play in the sparkling swimming pool for some family time. Located on the sun deck, facing the Atlantic Ocean, there is a hot, bubbling Jacuzzi where you will find yourself relaxing and soaking at the end of a busy day of North Myrtle Beach adventures. The Jacuzzi and the swimming pool are next to each other on the sun deck where you can keep and eye on the kids and be part of family fun. Pier Watch Villas I North Myrtle Beach condo rentals are located oceanfront. Outside of the North Myrtle Beach condo rentals you will find a short sandy path that will take you directly to the Atlantic Ocean and white sandy beaches. You will find miles of beach for you to walk along and collect shells or bring a beach towel for an afternoon nap under the sun. Just a short walk down the beach you will find a fishing pier for an opportunity to catch your very own fish. Elliott Beach Rentals is not affiliated with onsite management or the HOA of Pier Watch Villas I.